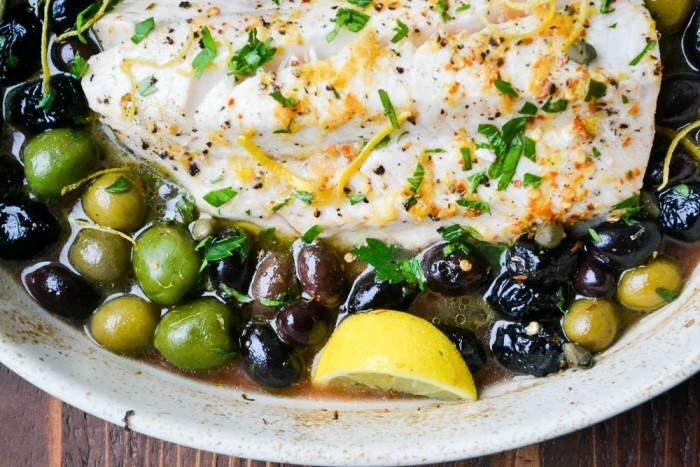 Cod with Lemon and Olives is a low fat and delicious 30 minute meal, full of healthy omega-3 fatty acids, and one of my favorites. For such a simple recipe it's packed with flavor! Lay out the fish in a pan with sides, or a casserole dish. Add the wine and lemon juice to the pan. Scatter the olives and capers around, then sprinkle everything with the salt and pepper, red pepper flakes, and zest. Drizzle with olive oil and bake for about 20-30 minutes until the fish flakes and is done through. The exact time will depend on your oven, and the thickness of your fish. Use your judgement, the fish is done when it is opaque throughout, and flakes when you cut it open.